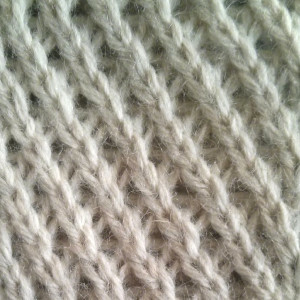 The Left Twist stitch is a knit stitch similar to the Right Twist stitch with the only difference being that it leans to the left instead of the right. Like the Right Twist stitch, the Left Twist stitch has a “waffle”-like design and is knitted with twisted stitches and is traditionally knitted using a cable needle. The pattern below is knitted with no cable required. Do you like the Left Twist stitch? Check out the Easy Day Knitted Headband pattern! Row 1 (RS): k1, *LT; rep from * to the last st, k1. LT (Left Twist): on the right side, knit through the back loop (ktbl) of the second stitch, leaving stitch on the left needle. K2tog through the back loops (tbl) of the first and second stitch. Slide both stitches off the left needle. Here is a video on how to knit the Left Twist Stitch.